John Hanson is CMI's audience development manager. He serves as the system administrator for our email/automation and CRM systems, managing internal subscriber and attendee data. Follow him on Twitter at @JPHAutomation and on LinkedIn. 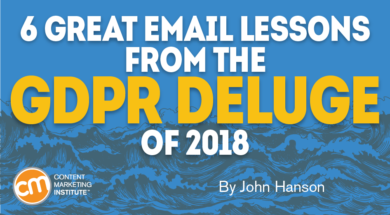 A few weeks ago, your inbox was probably stuffed with GDPR emails. Mine was. These emails, prompted by the European data protection and privacy law that took effect May 25, asked us to confirm our interest in continuing to receive email from the sender. Many asked us to review and accept new privacy policies. Some thanked us for being loyal subscribers. Some begged us to stay subscribed. Some let us know how so-and-so brand can help you, as a marketer, ensure GDPR compliance, avoid fines, and make millions of dollars using their tools. No matter what size organization you work for, you have decisions to make – or at least discuss – prior to jumping into the evaluation of marketing automation providers. Don’t rely on the vendors to become the experts in your business processes, people, systems, and data. You must get your house in order first. 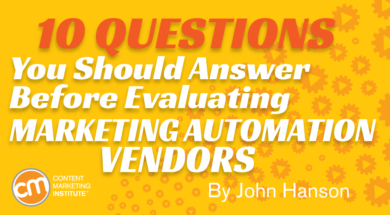 Once you get the green light to acquire a marketing automation system, start the review process to better identify which vendor is right for your organization with these 10 questions.